If you walk or hike you’ll wear suitable footwear such as walking boots or heavy duty walking shoes. Wearing suitable footwear will protect your feet when you’re out and about on your walks. If you walk in warmer weather you also have the option to replace your shoes or boots with a pair of walking sandals. Rubber soul and textile top. Who Needs to Use Walking Sandals? Anyone who walks or hikes can wear a pair of decent walking sandals. Sandals will support your feet as well as providing the grip that you need. Walking sandals also allow your feet to breathe which helps to prevent odors. Walking sandals can be worn by men and women and you can even buy kids sandals. Sandals are also suitable for the elderly as they’re easier to put on than a pair of shoes or boots. It’s worth noting that it may take a few weeks to break in the sandals before they’re completely comfortable. Are Walking Sandals Different to Regular Sandals? Walking sandals are made differently to regular fashion sandals because they suffer from more wear and tear. The soles on walking sandals are more sturdy and they’re also textured for grip. The straps on walking sandals are thicker than those on regular sandals to keep the footwear fastened securely. The materials used to make walking sandals are also selected for their durability. Walking sandals may get wet or they may get scuffed or scratched and they need to withstand this type of wear. Heavy duty rubber, leather and manmade materials are used to make sandals that are suitable for walking and hiking. 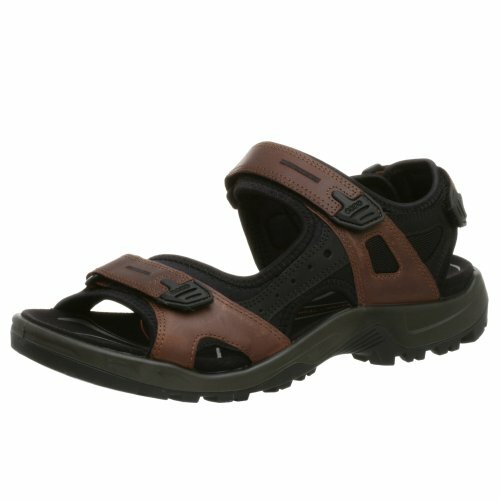 How Do I Choose a Pair of Walking Sandals? One of the most important parts of a walking sandal is the sole and the level of grip that it provides. When you’re walking you may be on different surfaces and you’ll need good traction to avoid slipping. Look for a sandal that has a heavy duty rubber sole that’s textured for maximum grip. Buy a pair of sandals that are easy to fasten and adjust so they’re comfortable. Most sandals can be adjusted so that they don’t move around too much when you’re walking. If the sandals aren’t a snug fit you could develop sores or blisters which can be painful. Choose a pair of walking sandals that are well made so that they last. Your sandals are going to be subjected to a lot of wear and tear and they need to be durable. The last thing you want is to have to buy new walking sandals regularly. Ensure the soles are grippy. Buy sandals that are easy to fasten. Choose walking sandals that are well made. What Are the Best Walking Sandals? We’ve looked at a range of walking sandals that are suitable for men and women and have selected five pairs. The main things we’ve looked at are quality, price, comfort and the level of grip on the soles. We’ve reviewed these five pairs of walking sandals and listed some pros and cons for each pair. The Teva women’s hurricane XLT sandals are available in a range of sizes and there are two color options. The sandals have a rubber sole and the top is made from textile for a comfortable feel. The sandals are fastened and adjusted with hook-and-loop fasteners and there’s a padded heel strap. Customers who purchased these sandals liked the amount of adjustment that the straps offered. People said that the sandals are comfortable and they support the arch of the foot. Customers also said that the soles of the sandals have good traction when walking on uneven and wet surfaces. A few customers who used these sandals for walking said the straps cut into their feet which caused sores. Some people also said the sandals left a black stain on their feet after wearing them. A number of customers said the soles of the sandals are very stiff and wide. These maui men’s sandals from BRUNO MARC are sold in various sizes and there are nine different colors to choose from. The sandals feature a textured rubber sole and a leather upper. The sandals are secured and adjusted with Velcro straps and the footbed is cushioned for comfort. Customers who purchased these walking sandals said they’re comfortable and suitable for long walks. A number of customers also said the sandals keep their feet cool when they wear them for long periods. Other customers commented that the sandals are attractive and more durable than expensive footwear they’d purchased in the past. People who purchased these sandals said they started to fall apart after a few uses due to poor-quality stitching. Others reported that the Velcro on the straps dont stick well and they have to keep refastening the straps. A few customers also said the leather was rough in places which caused blisters. These men’s arroyo II sandals made by KEEN are available in a range of sizes and there are three colors to choose from. The sandals are made from a combination of leather and fabric with a bungee lacing system. The sole provides a good level of grip on various types of terrain and the sandals have a rubber toe cap. 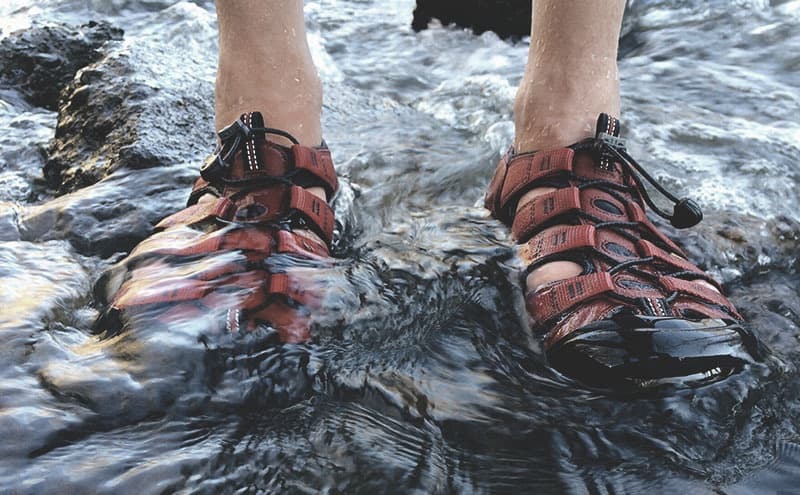 Customers who purchased these sandals said they’re great for walking and hiking long distances. People said that the sandals are lightweight and comfortable when worn for long periods of time. A number of customers were impressed with the level of grip and the protection provided by the rubber toe cap. A number of customers who purchased these walking sandals said that the sole came away from the sandal after a few months. A few customers said that they had difficulty fastening the sandals and couldn’t get them tight enough. Some people also said they would’ve liked the sandals to have more inside padding. 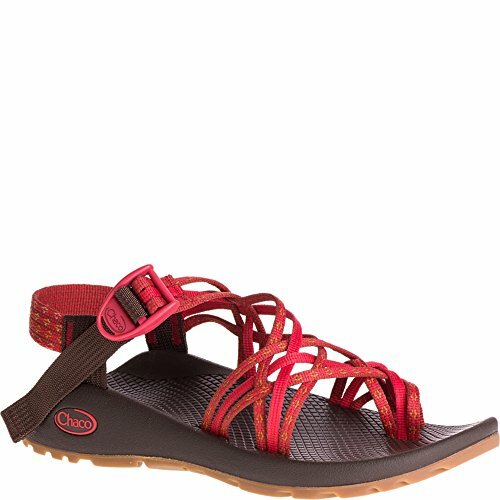 The Chaco women’s ZX3 classic sport sandal is available in a range of sizes and nine colors to choose from. The sandals have a grippy rubber sole and the straps are made from a polyester jacquard webbing. The sandals are fastened with a buckle and strap at the heel and the straps allow for some adjustment. Customers who purchased these sandals said the materials used to make the sandals are of a high quality. 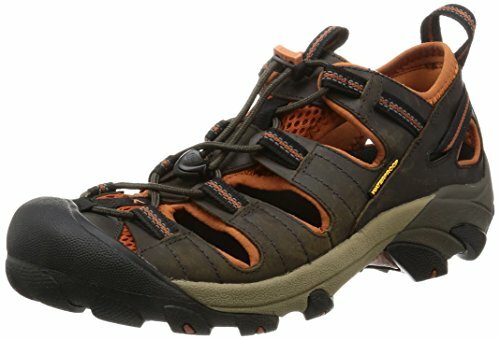 People said the sandals are comfortable when hiking and the level of grip is good. Customers also commented that the soles of the sandals protect and support their feet when doing various outdoor activities. Other people who walked in these sandals said the sole is too heavy and they had trouble walking in them. Customers also said that the straps are difficult to adjust and caused blisters. A number of customers reported that the sizing is inaccurate and their sandals didn’t fit. These men’s yucatan sandals made by ECCO are available in various sizes with 16 color options. The sandals have a textured rubber sole for maximum traction and the upper is made from leather and textile. The sandals are an open-toe design and are secured and adjusted with three hook-and-loop straps. People who purchased these walking sandals said they’re well made and durable. Customers said that the sandals are easy to put on and adjust with the Velcro fastening straps. 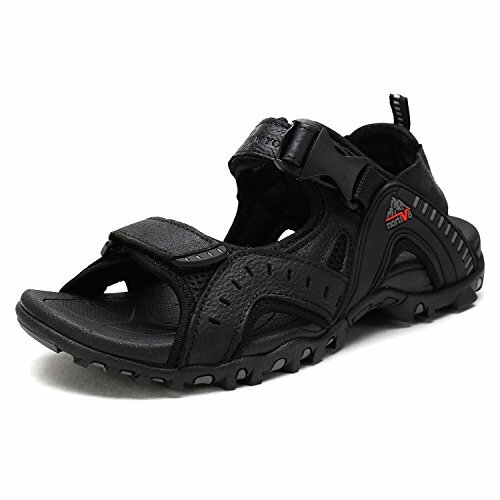 Customers also said that sandals are comfortable when hiking on rough terrain and rocky surfaces. Some users who wore these sandals for walking said the straps were irritating and they developed blisters on their feet. A few customers said the arches on the sandals are higher than they would’ve liked. A number of people also said that sandals retain sweat which results in an unpleasant odour. Each pair of sandals that we’ve reviewed are suitable for walking on various surfaces and they’re all similar in design. All of the sandals have decent textured soles for grip and they’re all comfortable to wear. 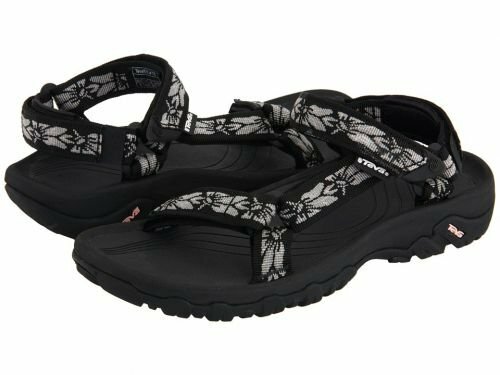 After comparing all of the products the best walking sandals are the Teva Women’s Hurricane XLT. These reasonably priced walking sandals are comfortable and easy to put on and adjust. The sandals can be used for walking on rugged terrain and soles provide a good level of grip. We also like the fact that the sandals support the arches of the feet which is useful when hiking. What are the Best Bunion Correctors in 2019?